Steve Wilson at the 21C Announcement - Lexington, Ky. When Mayor Gray took to the podium, he formally announced what he described as "the worst kept secret in Lexington: 21C is coming to town!" Gray spoke of a decision made by the directors of the Fayette National Bank one hundred years ago this month (April 25, 1912). They opted to erect a fifteen story skyscraper at the northeast corner of Main and Upper Streets. The building would be the tallest in Kentucky outside of Louisville. Gray took a pause from his remarks as the bell at the old Courthouse rang ten times as if to honor each of the decades since that 1912 decision. 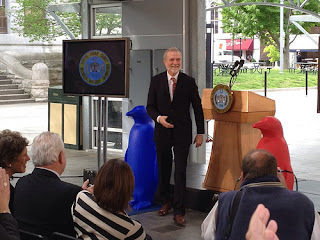 After Mayor Gray left the podium, owner/visionary/philanthropist Steve Wilson took the podium. Amid laughter, he discussed the ubiquitous red penguin that marks the 21C brand. Wilson and his wife/business partner Laura Lee Brown knew that a red penguin wouldn't fly in Lexington so he quickly presented to the assembled crowd the Italian designed blue penguin (pictured above). Fayette National Bank Building - Lexington, Ky. 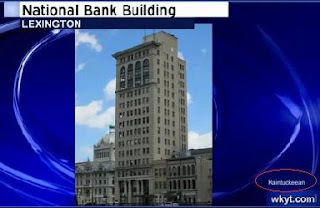 The Fayette National Bank Building is in the Beaux-Arts classical design. Under its new 21C brand, it will house a contemporary art museum, approximately 80 hotel rooms, a restaurant, meeting rooms, ballroom and bar. The building was completed in 1914 and it is anticipated that 21C will begin work later this year with completion one hundred years later in 2014. Architecturally, the building is divided into three distinct vertical tiers spread across four bays.The first four stories are of Bedford limestone with 2 pairs of Ionic columns stretching three floors to create an impressive, yet approachable Main Street frontage. The top four floors of the building act as a cap with beautiful three-story arched windows. Although the middle floors are a non-descript shaft, the top and bottom tiers give the building incredible beauty and character. More of the buildings history, architecture, etc. can be found on my earlier post. Sometimes, it's nice to see your "name" on air.